Global use of mobile devices has exploded in recent years, driven by society’s need for anytime, anywhere services at the touch of a button. Yet, privacy concerns over access to ubiquitous data remain a concern in adopting this technology. With the right mobile platform, users can enjoy a myriad of conveniences in their daily lives from personal home security alerts to “smart” appliances to real-time traffic information, without compromising privacy by giving users control of the information they share. 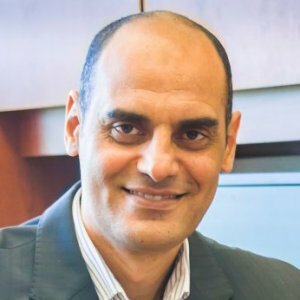 Dr. Khalid Elgazzar, a Canada Research Chair in the Internet of Things (IoT) and Associate Professor in the Faculty of Engineering and Applied Science is developing cutting-edge methods to advance wireless technologies that will ensure the seamless interaction of smart services across critical areas such as health care, transportation, emergency response and law enforcement, and industrial automation. His CRC research agenda supports the expansion of Internet-enabled computing devices and advancements in wireless technologies. He is examining ways to embed computing devices such as data sensors in physical environments to create “smart spaces” where information can be relayed in real-time to help people live smarter, safer and more productive lives. His research also includes the development of a robust authorization control system to protect users’ privacy. The technology in embedded computing devices such as sensors can revolutionize the way people carry out everyday tasks, something society is becoming increasingly reliant on in everyday life. Previously, Dr. Elgazzar was an Assistant Professor at the Center of Advanced Computer Studies at the University of Louisiana at Lafayette, and is an Adjunct Assistant Professor with the School of Computing at Queen’s University in Kingston, Ontario, where he has lectured; along with Carnegie Mellon University in Pittsburgh, Pennsylvania, and the Arab Academy for Science and Technology in Alexandria, Egypt. Dr. Elgazzar holds a PhD in Computer Science from Queen’s University. He earned a Master of Computer Engineering and a Bachelor of Engineering in Computer and Communication Engineering from Alexandria University in Egypt. Recognizing the of future technology, his keen interest in computer networking and model computing evolved into the idea of using mobile devices as a platform for people to not only access information online, but use it to improve efficiencies in their daily lives.